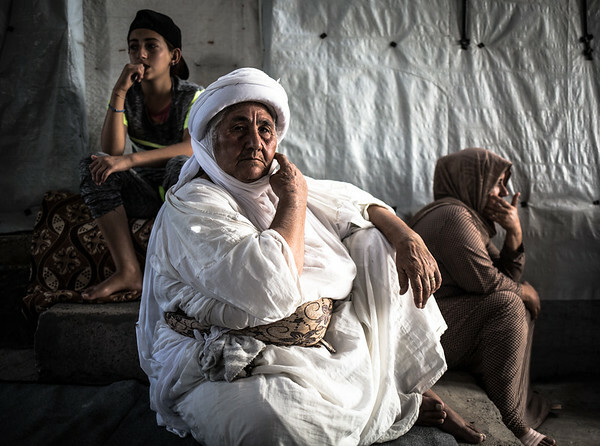 Base Khalaf, 60 years old, has been displaced with her family in this camp in Dohuk for 4 years now. "Islamic State killed one of my sons four years ago. Since then I was unable to visit his grave. It is very hard to go back to Sinjar. The situation is not safe and the journey is very long," she says. "Our life in the camp is difficult. There is little water and electricity. The tents are dirty, made of nylon, and easy to burn especially in the summertime. In the summer, many tents get burned and for an elderly and disabled person, it’s not easy to run. People have died because of this recently. Winter is coming now and so is the rain, the cold and the wind. These tents will barely protect us. I wish I could go back home, but I just can't".